Whether they’re powdered, glazed, frosted, or filled with jelly, doughnuts usually offer an intense sugar rush. But now chefs are crafting deep fried delicacies using flavors that showcase flavors on the other end of the spectrum. Here are seven savory doughnuts for National Doughnut Day – or any day, really. 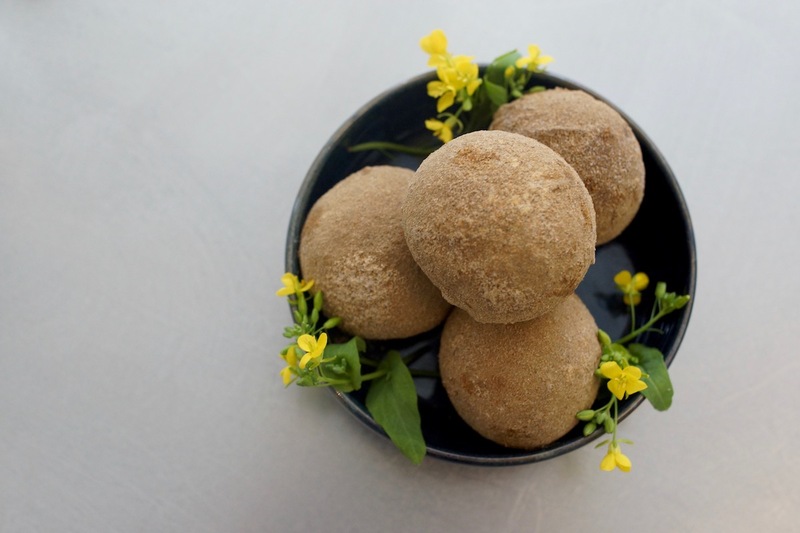 The doughnut and a bonus doughnut hole are dusted with ras el hanout, a Moroccan seasoning, which literally means a mixture of the dozen best spices a seller has available, such as cardamom, cumin, and cinnamon. They’re the perfect complement to a foie gras parfait rimmed with a band of honey butter. 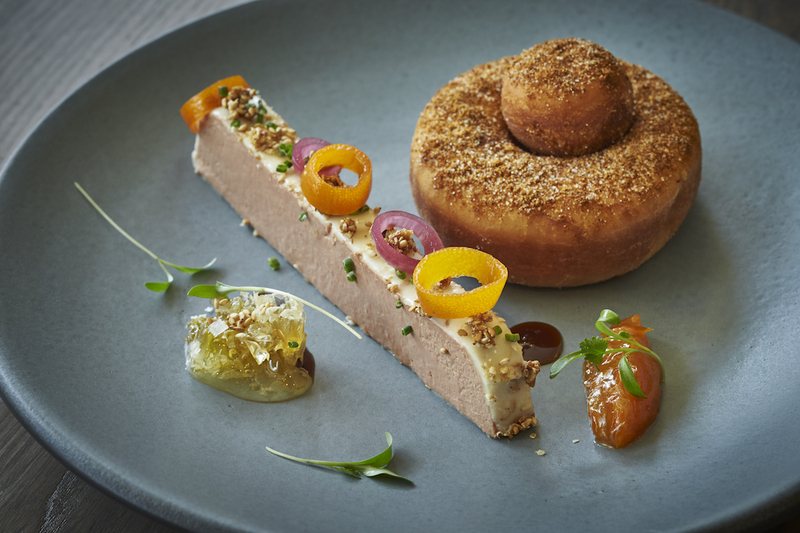 Spread the foie on the fried dough for a bite that is equally savory, salty, and sweet. Make a reservation at Arroz. We love churros. We love bacon. 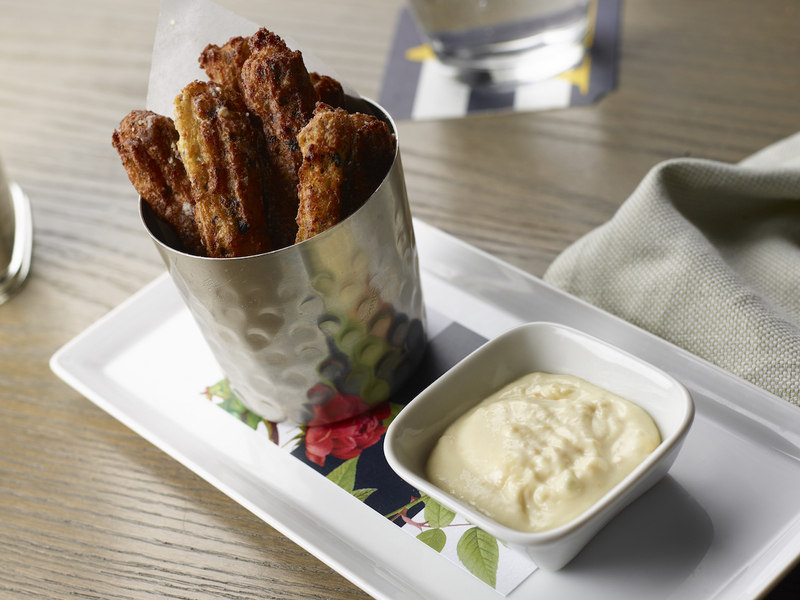 So we are absolutely head over heels for these bacon jalapeno churros dusted with white cheddar powder. Make a reservation at Andiron Steak & Sea. Bite into these beignets to find a mélange of mushrooms – maitake, cremini, shimeji, and shitake. They’re dusted with a powder rich with dehydrated miso, shitake porcini, and smoked tomatoes. On the side, there’s an aerated cheese sauce made with raclette and béchamel. 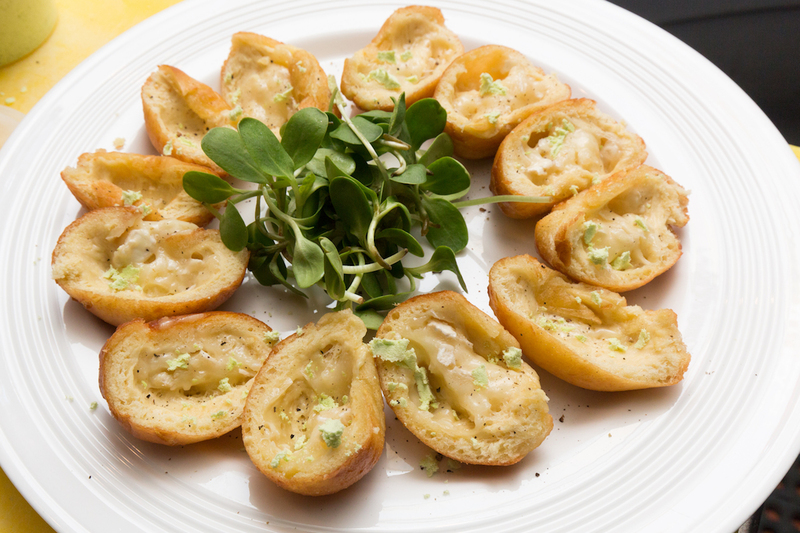 Every element adds glutamate to create an appetizer that’s utterly umami. Make a reservation at Eden. Roll up for Sunday brunch to access chef Rob Rubba’s savory rounds forged out of butternut squash to impart an earthen sweetness. The icing is enriched with Vadouvan curry and speckled with sesame seeds. Definitely not a flavor you’d find at Dunkin’ Donuts. Make a reservation at Hazel. These tender circlets always remind us of autumn. 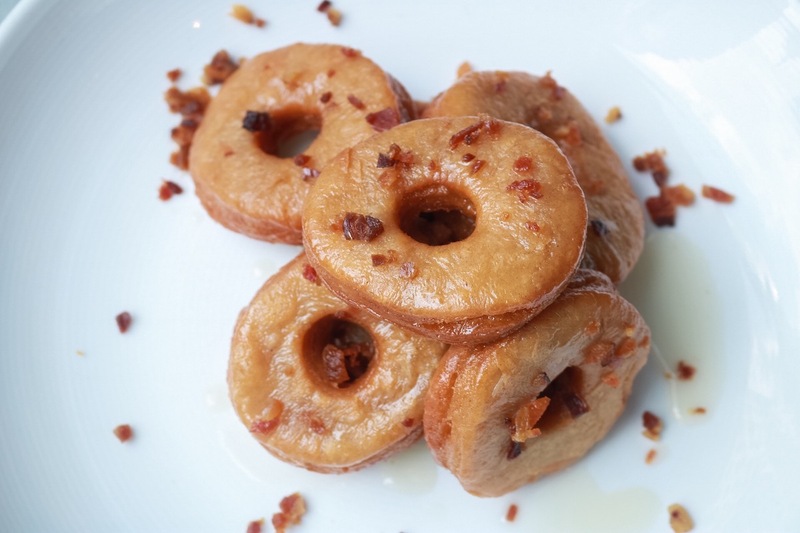 Fried in bacon fat, they’re apple cider glazed and dappled with crispy bacon bits. All that’s missing is a chill in the air and fiery rainbow of leaves on the trees. Make a reservation at 5Church. Ever since discovering mozzarella sticks as a child, we have been enthralled with deep fried cheese. That’s partially why we love executive chef Patrick Higgins’ doughnuts filled with melted Camembert and powdered with chive dust. The other reason is that they’re freaking delicious. Make a reservation at the Aurora Inn Dining Room. These beignets be bangin’. 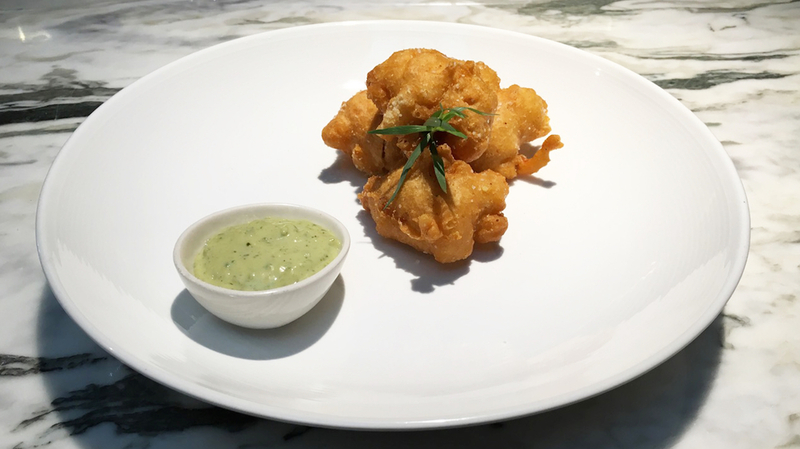 Executive chef Michael Isolani sautés crawfish tails, mixes them with fontina cheese, batters them, and tosses them into the fryer. The golden nubbins come with a side of tarragon aioli for dipping. Make a reservation at Trinity. 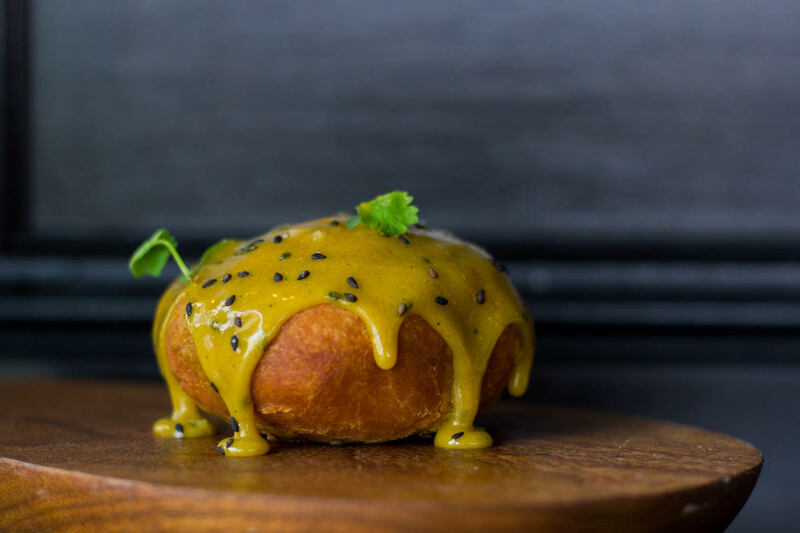 Have you been spotting savory doughnuts on menus? Let us know where here or over on Facebook, G+, Instagram, Pinterest, or Twitter. And, remember to snap + share your #dishpics with us on Instagram for a chance to win in our weekly giveaway. Photo credit: Patrick Higgins (Aurora Inn). Sidecar donuts in Costa Mesa California has two offerings that should be considered, first is “green eggs and ham” and the second, although it contains a small amount of raspberry preserves, is the “Montecristo”. I have no idea what it takes to produce these two items but they are truly beyond amazing. Except for maybe one of those “doughnuts,” they’re not doughnuts. I agree with Cosmo. They are not really doughnuts, just as sweet bagels are not really bagels. Let’s call it what it is.